Oberalm is a community in the Tennengau area of Salzburg and has a population of approximately 4,200. Oberalm can be found just outside of the capital Hallein, which gives the community a bit of the feeling of a suburb - not dissimilar to the Flachgau communities in the immediate surroundings of Salzburg city. Speaking of the latter: Oberalm is also directly connected with Salzburg via a regional railway link, it takes only a few minutes to get to the capital. The fairly recent development or extension of this link has led to an increase of the already high real estate prices in Oberalm. Oberalm is an ancient settlement, its name is derived from the Illyrian "Albanthan" (above the mountain cabin - essentially what the current German name means, too). After the age of migration led to Bavarian rule, Oberalm was first mentioned in a document in the 8th century - again rather early, referring to the community by its Latin name Albina. 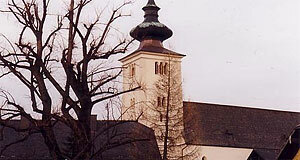 At this time, the monastery of St. Peter in Salzburg owned several farms in the area, which is part of the reason why its development is so well-documented. Throughout the Middle Ages and early modern times, Oberalm played an important role as a centre of trade and transportation, but also as a town of residence for Salzburg nobility. The castles of Kahlsberg and Winkl reflect that. Speaking of sightseeing attractions in Oberalm: In addition to the 16th century Schloss Kahlsberg castle and the Schloss Winkl (today home to a school), you should also note the 14th century castle Haunsperg, which is now a hotel. The market square of Oberalm is dominated by 17th century town houses similar to those you could find in nearby Hallein or Salzburg. The Gothic parish church has a main altar in Baroque style from 1707. Note also the old school building and the Kulturhaus Filzhofgütl, a venue for cultural events. International visitors that stay in Oberalm often do so because of the vicinity to Salzburg. If this applies to you, you should definitely go for a walk and have a closer look at the place.